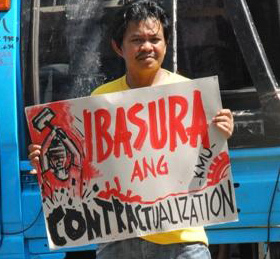 We hope that our observations can help the summit participants in understanding the socio-economic, political and military context in which the workers of Mindanao are being subjected to the escalation of of exploitation and oppression. You can best discuss in detail the conditions that are adverse to the workers of Mindanao, make the necessary conclusions and define the tasks of fighting for their rights and welfare, strengthening the trade union movement , opposing human rights violations and demanding justice for the victims, be they individuals, organizations and entire communities. Your summit opens the door to more work in arousing, organizing and mobilizing the workers and their supporters in Mindanao. We wish you ever greater victories in this regard. We are confident that your resolute and militant work among the workers will lead to better conditions for them and will contribute to the advance of the peopĺe’s movement for realizing national independence, democracy, social justice and all-round development. ← Free IPA activists arrested for rejecting APEC and trade liberalization agenda!